This is a page where I'll put any characters I've created out of LEGO, whether they're for a Brickfilm, a story, or anything else. 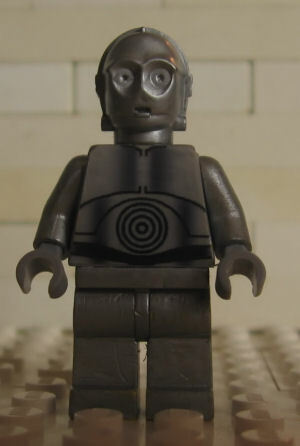 I will also put custom minifigures I've made from movies (such as TC-14 from Star Wars: The Phantom Menace). The Man with the Top Hat is a character I thought up long ago, probably sometime in late 2005. 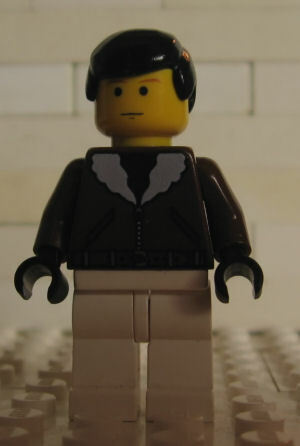 He was the star in several short Brickfilms that were very poorly made, all of which I made in early 2006. 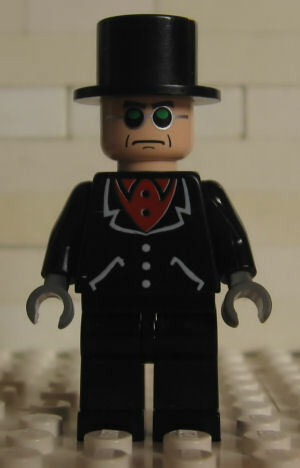 He is also the star in a more modern filming venture, The Man with the Top Hat, my entry to the Brickfilms Fame, Infamy, and Glory Competition, as well as The Tompa City Menace. Please note that I am not in any way a fan of peach minifig parts. The only reason he's peach is because that head doesn't come in yellow, and I don't like face decals. The Skeleton, one could say, is the Man with the Top Hat's partner in crime. He has a high, squeaky voice, and is also featured in the films mentioned above. 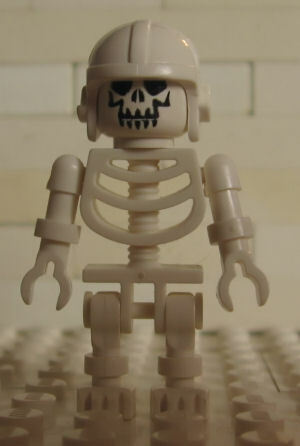 TC-14 is my first real custom minifigure. He was created by taking an old torso, legs, and arms, and painting them silver. His head is a C3-P0 head painted silver, and his hands are just light gray. I then created two decals for him (one for the front and one for the back), and printed them on transparent sticker paper, so the silver would show through. Also, I forgot to take a back picture of him, but it looks just like C3-P0, only silver. This is my signature figure, Nick Durron. He is a minifig version of me. The only difference is that I have slightly off black hair, whereas he has black hair. He has been featured in only one of my films, The Tompa City Menace, but he does not speak. I intend to put him into every future film I make. A black Spider-man! 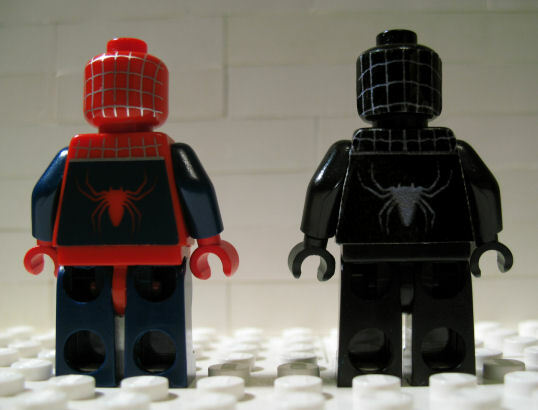 Here we see him standing next to the official LEGO Spider-man. 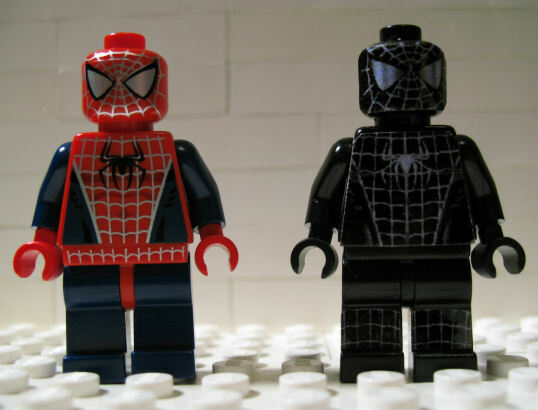 I made him simply because LEGO wasn't going to be doing Spider-man 3 sets, and I really wanted the black Spider-man. Unfortunately, I don't have the greatest printer out there, so his decals came out a bit fuzzy, not nearly as sharp as the LEGO Spider-man. Mine, you may notice, does not have a belt decal, but does have leg decals. From the back, they are identical except in color. 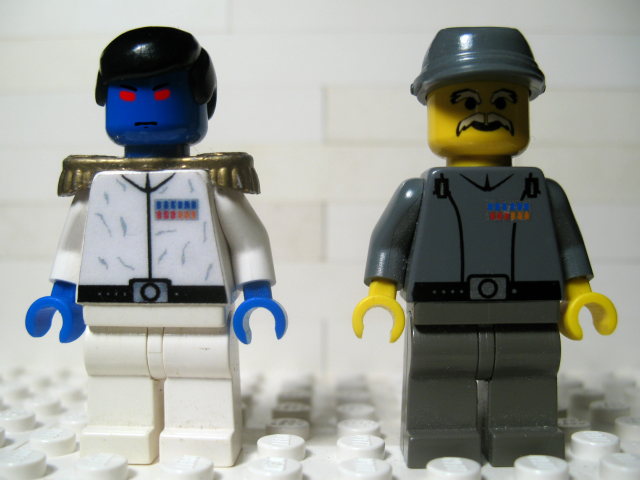 Here's Admiral Thrawn, along with Captain Gilad Pellaeon, his right-hand man. I've had these minifigs sitting around for about two years, since I built them for my film Star Wars: Dark Apprentice, but only just got around to photographing them. Thrawn's eppaulettes are really golden, painted with a gold marker I bought. Though it looks good, it comes off very easily. His torso is a custom decal I made, while his face is digital, added in Adobe After Effects. I could have made a face decal, but I hate the way they stick out around the edges, so I did it this way instead.